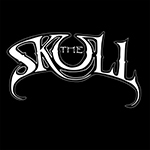 The Skull - Sometime Yesterday Mourning / The Last Judgement 7"
The Skull started as old Trouble members decided to start playing the early material by this original traditional doom metal band live a few years ago. Finally they also decided to write some new material. This single was originally released only on CD in 2014 and now sees the light of day on vinyl for the first time thanks to Svart Records. Along with Pentagram and Candlemass, Trouble has been one of the most important doom metal bands from me since the mid 80s, so I was naturally interested in this project. It's good to hear that "Sometime Yesterday Mourning" is great old school doom bringing to mind the first Trouble album, although it maybe has a bit more melody. The heavy guitar sound is pretty much the same, and Eric Wagner's vocals work out very well. Great stuff! I'm even more excited about the B side that is an old trouble classic "The Last Judgement" originally released on a Metal Blade compilation LP before the debut. The riffs are heavy as hell and Eric Wagner's shrieking vocals are perfect for the vibe. I've always loved this song and it sounds really good now as well. I sort of lost interest in Trouble after the same-titled album in 1990, but you just can't beat these old-time doom vibes this single offers... Now I just need to get The Skull's album and brand-new single as well! 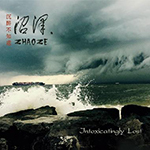 Zhaoze is a quartet from China combining beautiful, atmospheric and mostly instrumental post rock with traditional Chinese instrumentation (gugin, xiao) creating very tranquil, cinematic soundscapes. 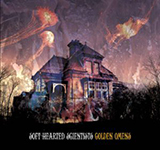 They have several released under their belt but this CD and digital release is their first Western release and it is a sort of compilation of the best tracks from their latest album with some other tracks. Apart from the very exotic sounding Chinese instrumentation they also use keyboards, guitar, bass, drums & glockenspiel. One of the tracks ("Into Your Dream", one of my favourites) also has s little bit of vocals. I really like the dreamy, mellow vibes the band offers, and when you close your eyes you get wonderful images of Chinese nature and ancient architecture. Although the tracks sometimes grow a bit on their way Zhaoze don't really ever get that rocking of heavy or intense like GSY!BE or even Explosions in the Sky, they always stay in the pleasant, laid-back territory which is just fine. The classic Chinese music influences and instrumentation is what makes this emotional and soulful band really special and interesting. They have great ideas and the playing is fluent and the sound crystal clear, so why don't your check them out? The Soft Hearted Scientists is one of MANY great bands that I have found through Fruits de Mer Records and definitely one of the most interesting as well. 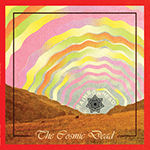 This double CD is the 7th album by this Cardiff-based psych rock/folk outfit and recorded mostly at home like some of their earlier stuff. There is a warm, home-baked feel on the album, but the sound and overall production is still great and professional. The album is divided into four parts and lasts for a little over one hour, so it would have fitted on one CD but there must be an explanation for it to be a double CD. Maybe they want the listener to stop for a while in the middle? There are 26 tracks in total (well, 27 on the back cover but...where is "From Broken Glass"? ), so average track length is pretty short. There are lots of little instrumental interludes, and just like before, all the little pieces form a nicely flowing whole. The lyrics are very important in the great songs that at first seem very simple. Only after listening to the album many times you realize how well-crafted and clever the music really is. The instrumentation includes electric and acoustic guitars, kitchen sink percussion, vintage keyboards and weird, psychedelic effects, and I really enjoy the vocals. I'm having difficulties in finding anything that sounds like the Soft Hearted Scientists, but they must have been listening to Syd's Pink Floyd to get so whimsical, late 60s/early 70s UK acid folk for the beautiful/spooky acoustic vibes, Robyn Hitchcock for the 80s alternative/indie ingredients etc. and there are lots of pop elements, electronic beats and even some surf & country stuff in there as well as nature sounds and other samples. I also really like the cover art made by one of the band members but I don't like this kind of cardboard cover where you have to get the CD's out from the very tight openings in the inside as it's almost impossible with my big fat fingers to do that without damaging the discs and the cover. Oh well, I guess patience is as important here as getting deep into to wonderful sonic world of the Soft Hearted Scientists. There's a highly limited (just 100 copies!) special edition with a poster available from the band's website right now so go and get it! The official release date is 8th July. 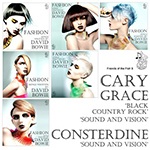 Cary Grace / Consterdine - Black Country Rock / Sound and Vision lathe-cut 8"
Oops, I'm a bit late again, sorry about that... Anyway, this promo package from Keith at Fruits de Mer got the full attention of Finnish customs because, in the normal fishy, wacky manner, it also included a couple of sachets of Crazy Candy Factory popping candy to put in your mind for an authentic vinyl clicks and pops while listening to the promo CD... Not sure if there were more that the custom officers have tested/tasted, but two pouches were left when the letter finally arrived. Okay, what else do we have here? It's a promo CD-r in cardboard cover featuring three tracks from a very limited (50 copies only!) 8" lathe-cut single only to be sold at Games for May event that was going on last Sunday in London. I've heard it was a blast! It might seem a bit pointless to review an ultra rare single that you might never be able to get now after the event, but who cares. So, let's concentrate on the music for a while. Those who have been buying all (or at least most) of the Fruits de Mer related stuff have been receiving some extra stuff at least once a year, and last year's freebie was a compilation CD-r of cover tracks by David Bowie called Fashion. This lathe-cut starts with one track from that compilation: "Black Country Rock" performed by Cary Grace, a songwriter/composer, producer, musician, and analogue synthesizer maker based in the UK. Cool, groovy stuff, and it's very nice to hear a Bowie song sung by a talented woman! I also particularly enjoy the analogue synthesizers on this one. Cary also offers a new version of Bowie track "Sound and Vision" on the B side, not one of my favourite Bowie tracks to be honest but still a very good version with the synths again. Finally, there's also Consterdine's a bit more chilled out instrumental take (from the Fasion CD-r) of the same track to end the 8". This is a very nice item, I can only hope to get the actual 8" some day without paying a month's rent on eBay. By the way, the next Fruits de Mer related festival 14th Dream of Dr. Sardonicus in Cardigan, Wales will take place on August 5-7, get your tickets from over here! 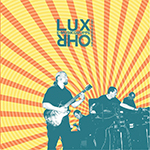 Turku, Finland has been pouring out some great sounds for a long time now and the cosmic/deep/ambient/electronic/Berlin School kraut act E-Musikgruppe Lux Ohr is one of the best bands that the town has ever had to offer. The lineup features three guys on synthesizers/electronics/drum machine and a guitar player who uses lots of e-bow. I've been following them since the Live at the Sibelius Museum CD-R that was put out in 2010 and since then they have released two studio albums, one split album and one live album on vinyl as well as a couple of tapes. 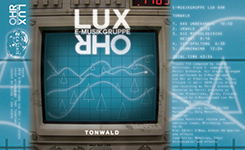 This Spring they put out the second tape and the live double album both in Germany, and let's check them out now. Tonwald is a limited tape (140 copies) release of their live performance recorded at Sibelius Museum Turku, Finland in April 2010, so it's sort of a sequel to the first CD-R release that included a live set recorded at the same venue one year earlier. There are five tracks in the set and the whole length is almost 44 minutes. The both sides of the tape has all the tracks, so it's easy to listen to. You can just float the whole duration without the need to change sides! And float you will. As usual, the tracks on the set form a continuous musical experience so the tracks ("Das Unbekannte"/"Urwald"/"Die Mythologische Heimat"/"Ich-Spaltung"/ "Sonnenwind") are firmly woven together without any breaks. Even though this is a live recording, the sound quality is amazing and the music highly enjoyable. Only the last part has been released as a studio version on the debut album Kometenbahn so fans will get lots of new stuff (unless they were lucky enough to be at the concert, of course...). A very nice release, I'd like to have this on vinyl as well, please! Kimi plays some wonderful guitar solos on this release, and the whole band is very focused and into it for sure. Both of these albums are warmly recommended for lovers of instrumental kosmische ambient music that makes you float in space and though other universes. Wonderful vibes!